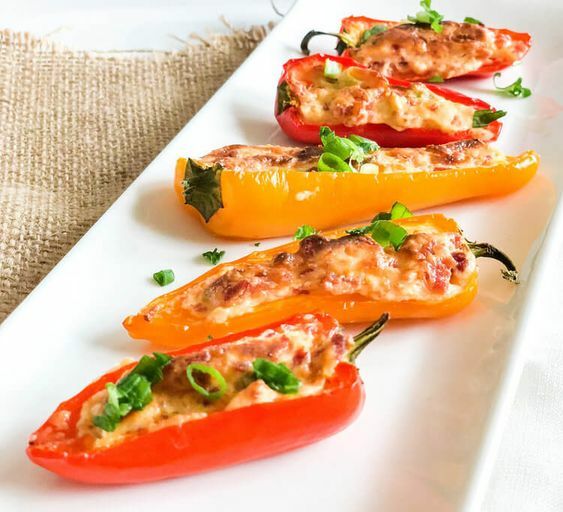 We had these yummy bell pepper bites at our Christmas dinner and I just had to share the recipe! I love bell peppers with a filling. The filling has a more rich flavor when the bell peppers are baked. This colorful appetizer is very simple and takes about 30 minutes. Eat more bell peppers because they boost the immune system. The immune boost mainly comes from the large amount of Vitamin C, but there is the most vitamin C in the red peppers. Lack of vitamin C in the body is called vitamin C deficiency and contain symptoms that include fatigue, muscle weakness, bleeding gums, and joint and muscle aches. A severe deficiency could lead to a rare disease, scurvy. According to the National Institutes of Health (NIH) men are recommended 90mg of vitamin C per day, as for women, 75mg per day. One serving of this recipe already provides you with 127% of your daily recommended value for vitamin C! Enjoy! Mix together hot sauce, sour cream, garlic cloves, turkey bacon, green onion and cream cheese. Fill in the cream cheese mix into each bell pepper half. Sprinkle cheddar cheese on top of each half. Mix together sriracha hot sauce, sour cream, garlic cloves, turkey bacon, green onion. Fill in the cream cheese mix into the bell peppers.